Wayde van Niekerk warned that the “sky was the limit” after smashing Michael Johnson’s 17-year-old 400m record when he roared to Olympic gold. “Achieving what I just did now, I think the sky’s the limit. There’s no way I’m going to limit myself, I’m just going to try and better myself each and every time I race,” said the South African. The 24-year-old, running in the unfavoured lane eight, blasted off the final corner to time 43,03, 0,15 quicker than Johnson’s previous world best set in Seville in 1999, a record that had taken on an almost mythical status. “I can’t even tell you what happened in the race, I was blind all the way!” Van Niekerk said. “As I got to the finish line, I was expecting one of them to catch me. I crossed the line, I looked left and there was no one. 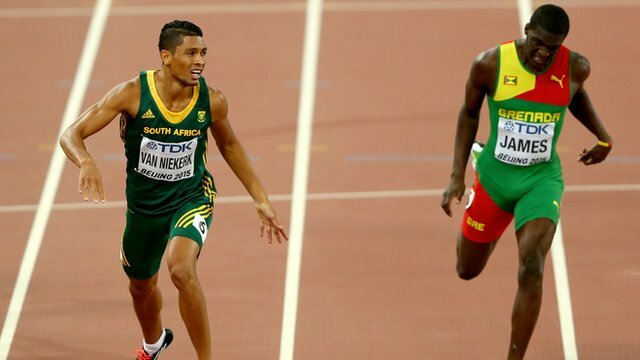 Van Niekerk said he had taken inspiration from silver and bronze medallists Kirani James and LaShawn Merritt, as well as Johnson and Jamaican Usain Bolt, who claimed his third successive 100m gold straight after the South African. The two gold medallists embraced on the track of the Olympic Stadium in what Van Niekerk said was a poignant moment for him. “There are guys who have inspired me, Usain Bolt, Michael Johnson, they’re amazing guys and I’ve learnt from them. Even the guys I’ve run against today, Kirani James and LaShawn Merritt, they’re guys who inspire me,” he said. “I’m still amazed just being here among all these great athletes. In the last Olympics in London, I was sitting at home watching these guys do their thing and today I’m in the mix with them and have the opportunity to run my best performance. “I’m just really grateful to be part of this generation of athletes and keeping this sport alive.” Bolt called Van Niekerk’s performance “brilliant”. “When he got the world record it was like ‘wow’,” he said. “I’m really happy for him, really proud of him, he did extremely well.” Invariably, in the current doping-tainted world track and field finds itself, Van Niekerk was asked directly whether he was doping. Van Niekerk played down being drawn in the outside lane, saying there were pros and cons. “I don’t think any athlete really wants to be in lane eight, but when you have it, you embrace it,” he said. Asked whether he’d be annoyed at Bolt getting the headlines, the South African replied: “Not at all! What he’s achieved as athlete speaks for itself. “It’s Usain Bolt, the king of 100m and 200m. I’m just grateful for being here and I’m going to try to build my legacy as concrete as I can. “The beginning of the year I had the opportunity to break the sub-10 (in the 100m) as well,” added van Niekerk, who became the first athlete to go sub-10 in the 100m, sub-20 in the 200m and sub-44 in the 400m. “I’m just trying to decorate my achievements as an athlete as much as I can and put my right foot forward each time I hit the track.” —AFP.